Though I don't go to a day job, morning starts promptly around here. Our two dogs feel they have to be outside before seven to oversee the comings and goings of those who do drive past on our little country road, on their way to work...and mornings are my most productive time anyway, so I've usually been making some progress on a manuscript before the dogs start barking at the door. What a beautiful morning this was today! Rather than rustle around for my D-SLR camera, risk waking up my husband and also risk missing this fleeting moment, I grabbed my cellphone and took a quick picture to share it with you. 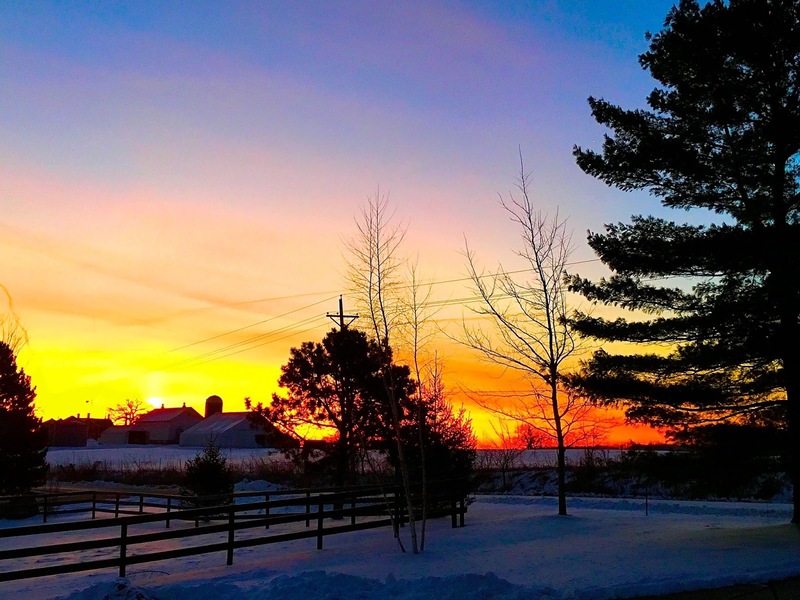 There was a glorious sunrise beyond our neighbor's farm to the east...and it's a balmy (comparatively speaking) +19 degrees! Running out to the barn to feed our three mares will be delightful in the warm sunshine in an hour or two. In the Midwest, we need to appreciate these days, because next week could bring bitter cold, ice or snow--you just never know. But fall and winter are my favorite seasons, and I love it all. Days like this fill me with such joy, anticipation and gratefulness for all the things that are possible within the hours until day's end. Today I'm finishing up AAs (author alterations--the last time I can review the Love Inspired novel that will be out in July) and can then get back to work on the Love Inspired book which will be out this coming November. What fun, getting to know a new set of characters, and the challenges they will face! But I'm also filled with anticipation and excitement over some travels this year, and best of all, a new grandbaby this February! I can't wait to meet this new little one! What are you looking forward to in 2016? Do you have plans with family, travel plans, or plans to pursue a hobby in greater depth? I would love to hear about it! Best wishes to you all for a wonderful year! That's a beautiful sunrise. I've seen a lot of sunrises since we moved to AZ. Some of them are breath-taking as the sun comes up over the mountain range. I would love to see them! I'll bet they are gorgeous!